Merry Christmas Eve to all of our readers who celebrate! Of course we couldn’t let a Manicure Monday on Christmas Eve pass by without creating a Christmas-themed manicure! Today, using a little bit of tape and glitter, we’ve created a Christmas tree manicure! I love this look because it’s actually way easier than it looks and there are actually a lot of different ways you could change it up. Read on to find out how I got the look! I started out with Seche Natural, as usual. If you haven’t guessed by now, it’s one of my favorite base coats. It dries fast and creates a thin, even base for the rest of your manicure. 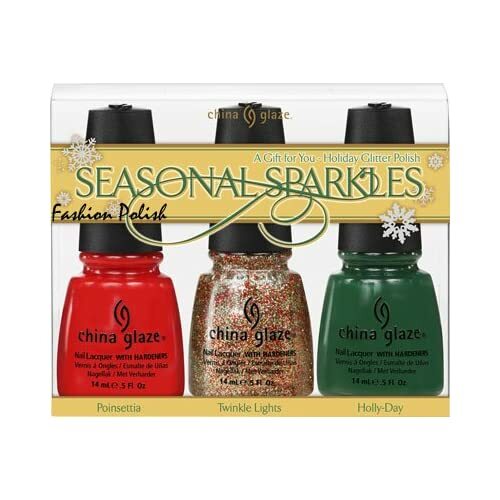 I used China Glaze‘s Seasonal Sparkles set to complete this look. The set comes with three colors, including Poinsettia (red), Twinkle Lights (a gold, green, and red opaque glitter), and Holly-Day (green). There are so many different combinations of looks to create with this set – it’s perfect for any Christmas manicure! For my base color, I applied two coats of China Glaze‘s Holly-Day, a deep leafy green. Before moving on to the next steps, it’s important to let your base color dry completely. We’ll be using tape to create the tree, so if your polish isn’t dry, it will ruin your manicure! To create the tree, start by creating a triangle on your nail with tape (I used painter’s tape – I think it works better and creates less of a mess than Scotch tape), as displayed in the top left picture. I like the tree to take up the majority of the nail, so I made sure the tip of my nail was the bottom of the tree and that the top of the tree went almost up to the top of my nail. Cut four thin strips of tape to create the decorations on the tree. Apply the strips in diagonal lines from the top of the tree down to the bottom, as shown in the top right picture, to resemble garland or lights going around the tree. Before applying your glitter, make sure to press down on all of the strips of tape. Any gaps between the tape and your nail can allow polish to get underneath and ruin the effect. Once the tape is pressed down, you can apply the glitter to create your sparkling tree! For the glitter, I used China Glaze‘s Twinkle Lights from the same Seasonal Sparkles set. At this point, be sure to apply the polish thick enough so you don’t see any green underneath. Before removing the tape, wait for the glitter to dry almost all the way. If it’s totally dry, it could be hard to pull the tape off, but if it’s still totally wet, it may not hold the shape of the lines. Once the tape is removed, I added a dot of China Glaze‘s Poinsettia to top off the tree! Finish with your favorite top coat – you know I love Seche Vite – and you’re done! I love this look because, even using the same three colors I used, there are so many different variations to create. You can create the tree on all of your nails (it’s an easy enough design! ), or just on your accent nails like I did (call me lazy). You can make your tree green with a gold background or gold with a red background – or whatever you’d like! What holiday-themed manicures are you creating?